in The Basics of Hydroponics . The most important factor in any indoor growing environment is, you guessed it, light. It is therefore the largest limiting factor in any indoor growing environment. The technology for lighting has improved vastly over the years and is continuing to evolve with new and better technologies. Without proper lighting, a plant can and will not be able to perform photosynthesis. Meaning that the plant cannot convert its food, or nutrients, into energy. Plants are able to be grown using artificial light, as long as the light is of the correct spectrum and there is no shortage of it. The most important part of a plant’s survival, photosynthesis is the conversion of light energy into ATP allowing its growth. The main wavelengths of the light spectrum that are absorbed by the plant are violet-blue and red ones. This means that the plants reflect the green that is visible to our eyes. The pigments that absorb these lights are numerous, but the most prominent is chlorophyll. Because of its prominence, it is the one we consequently know the most about. The absorbed energy from the sun is used to convert the ingested carbon dioxide coupled with the water and nutrients given it, to make carbohydrates which actually nourishes the plant and promotes new cell growth. This allows for the vigorous growth you see in healthy plants, and oxygen is a chemical byproduct of the conversion. Two main processes go into the overall photosynthesis reaction. The first one is the one that requires the light, or the Light Reactions. This is where light energy from the sun or other source is absorbed and changed into ATP.The second (known as the Dark Reaction) is the phase where the energy that was formed from the last process is used in combination with the carbon dioxide and nutrients taken in to create the carbohydrates necessary for them to grow. Light is a requisite for healthy plants so correcting the lighting may be the answer to a growing problem. Because the spectrum of light is different in each season, a plants growth is subject to what season it currently is. Spring time is associated with the blue end of the spectrum, promoting more vegetative growth in most plants and also a carousing mood. Fall is associated with the red end of the spectrum and therefore promotes a higher flower to leaf ratio in flowering plants. Metal Halide lights produce light more on the blue side of the spectrum and High Pressure Sodium (HPS) lights produce more light on the red side of the spectrum promoting flowering. These lights are the main source of light in any indoor garden. With these lights, gardeners are no longer limited by the finite number of lumens in the growing environment. These lights are also the most efficient on the market right now, producing 4-6 times as many lumens per watt than any incandescent light of the same wattage. They also last much longer. These bulbs range in size from 100 watts to 1500 watts. An HID lamp operates with a capacitor, a properly matched transformer, and a lamp bulb which consists of an inner tube filled with a chemical mixture. Basically, you have a cord that goes to the socket that powers the bulb, as well as a metal ballast with a cord that goes to the wall outlet. A reflective hood is used to harness the light that would project upwards and reflects it down to the plants. These reflectors are either painted white inside or are plated with a highly reflective brilliant chrome or aluminum. Some reflectors are also built with a hole that allows hot air to escape out of the room, making a more favorable environment for the plants. This leads to the main drawback of an HID lighting system: heat. These put out an intense amount of heat, causing plants to dry out faster. Another drawback associated with these lights is that they still don’t produce the full spectrum of light. These lights are the closest to natural light that humans have thus far created, but natural sunlight is still a more full and vibrant answer. There are ultimately two types of HID lamps to be aware of which are Metal Halide and High Pressure Sodium. It is important to know that any HID light system must correspond to the wattage and type of bulb. 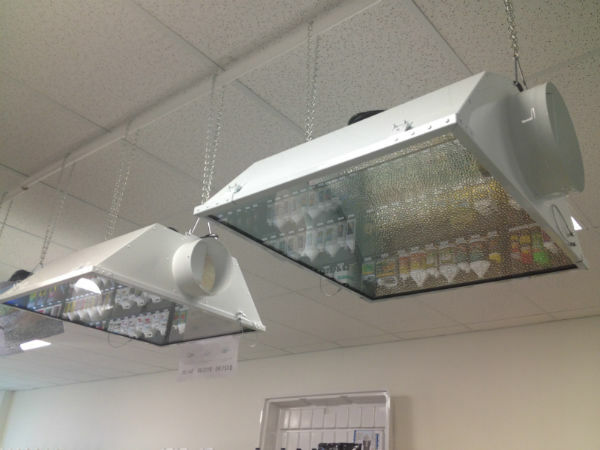 A 600 watt HPS system cannot sustain an 800 watt HPS bulb. This also pertains to a HPS system not being able to be able run an MH bulb. This restriction is starting to be taken care of with conversion systems bulbs that allow for more flexibility. HPS conversion bulbs produce sodium light and are designed to be used in MH systems. MH conversion bulbs, on the other hand, produce halide light and are designed for HPS systems. Of the two kinds of indoor growing lights, metal halides have the more balanced spectrum of light. They produce light from the bluer end of the spectrum, indicating to the plants that its spring and time for growth. Therefore, generally these lights are used for plants that are encouraged to grow many leaves and become bushy such as lettuce, spinach, cabbage, and herbs. They also excel at giving plants what they need in their vegetative stages of growth. This type of light promotes tight intermodal spacing between branches, and helps the plants develop thick stems and leaves which will later support larger fruit and flower growth. Recent technological updates have allowed for metal halide lights that provide more light on the red end of the spectrum. The AgroSun Gold is a stereotypical example of this type of lamp, producing an astounding 49% more red light. These lights produce a less balanced light than metal halides but produce the light necessary for the flowering stage of a plant. This means it produces light on the red end of the spectrum, signaling plants to begin their reproductive process. At 97-150 lumens per watt, these lamps produce more lumens than a metal halide lamp. However, if you only expose flowering plants to this red spectrum, it will lead to an unnatural look (the sun doesn’t produce simply a red spectrum or blue spectrum of light but will produce higher ratios of each). Plants exposed to only the red spectrum will typically stretch, lose their color and simply look unnatural. Just like new MH lights, HPS lights have begun to have more natural levels of the light spectrum. The SunAgro (HPS) and the Hortilux increase the amount of light on the blue end of the spectrum by about 25-30%. These lights allow for the more natural growth that the sun would incite. Fluorescent lighting is typically used in the beginning phases of a plant. It excels at sprouting seedlings and initiating rooting in nascent cuttings (clones). An average fluorescent bulb produces about 2300 lumens, which is not close to enough to grow an average tomato plant, which requires from 41,000 to 46,000 lumens. There are some specialized fluorescent bulbs that maintain the full spectrum at a high output which will vegetate plants at an average growth rate. However, growth will still be much faster and fuller with an HID light. The benefits to using fluorescent lighting are not few. They are very energy efficient and therefore relatively inexpensive. They also can emit a wide spectrum of light that is fitting for most plant growth. They also produce a low amount of heat. Overall, these lights are the go-to lights for seed sprouting and growing very young plants. Each type of plant requires a different amount of light. Peppers and tomatoes need much more light than lettuce or herbs because they have to flower. Some plants grow better in the winter and flower in the summer, however, most plants grow during the longer days of spring and early summer. They then begin to flower as the days shorten in late summer, fall, and early winter. These conditions can be easily simulated by an aware grower who is growing indoors. Reproducing natural light cycles that a plant would get in the wild is one of the most important jobs of the indoor grower. Light has an astounding amount of influence on whether a plant will continue to grow or begin to flower. Plants that are exposed to long periods of light,such as they might experience in the spring, do not usually flower until the days become shorter, as in the fall. In general, 18 hours of light is the best to promote vegetative growth, whereas about 12 hours of light is the best environment that stimulates flowering. Some plants, however, may function opposite to this cycle. The majority of plants need a regular schedule that includes periods of light and dark. During the light phase they absorb the light energy, then convert that light energy, along with nutrients and CO2, into carbohydrates during the dark phase. Consistency is the key component in reproduction of the cycle of nature. This means that although they need a certain number of hours a day in both light and dark, you can’t simply switch the lights on and off whenever you want. You want to try to emulate the outdoors as much as possible because, yes, that is where the plants have evolved. It is also important that the plants get their light and dark at the same time every day. They have a biological clock just like a human, and disturbing that clock causes a lot of unnecessary stress. As implied before, the general range of darkness is 6-12 hours every day. It is important to not disturb these dark periods by having lights on near or anywhere around the plants. Therefore, it is probably best to keep the plants in a room that contains nothing that is needed at night. Not giving plants enough light will inevitably make them weak and ill looking. A common mistake growers make is placing plants too close together, making it difficult for the plants to receive the light. Therefore, if you have light supplies that aren’t sufficient for that type of environment, plants will exhibit the effects shown by light deficient plants. A light meter can be used to detect if your plant isn’t receiving enough light and exactly how much you need to add, or how far to space your plants with that light. The light meter is placed on the plant and uses a photo-sensitive cell that displays the light received in foot-candles. In order to maximize your light potential, you need to put your light and plants in areas that reflect light very well. This is the essence of having the most efficient growing area possible. Your best choice when looking for reflecting objects is Mylar, or that shiny metallic looking sheet that reflects the light like a mirror, making it your best choice and most efficient at containing light. Another type of reflecting material that can be used is Black and White Plastic. You can put the black part against the wall and have the white part reflecting light onto the plants. This method is fairly easy because you simply hang it on your wall and wipe it down in between harvests. The third and simplest/cheapest method is to pain your walls white. This is another method that isn’t the best reflector, but is fairly easy and will make a big difference on your plants. Many light bulbs are not suitable for lighting plants. They are not only inefficient, but also don’t provide the correct color spectrum or levels of brightness. These types of unsuitable light come from incandescent light bulbs. What you really need when growing plants is an HID lamp and bulb. These bulbs actually do contain the correct color spectrum and sufficient amounts of light required to grow a healthy plant. There is one certain thing to be aware of when using these HID lights and that is you can’t use a MH bulb in a HPS system or an HPS bulb in a MH setup. Although this is a slight problem, there are still many ways that you can get around this. Scientists have created conversion bulbs which allow you to forgo this rule and use whatever type of light you need. This allows you to have one fixture and switch out bulbs when it is either time to begin the vegetative state or the flowering stage. As discussed before, the Metal Halide lights are the blue light used for the vegetative phase of the plant and the High Pressure Sodium has the red light necessary for the flowering stage of a plant. Now, to simplify the process even more, there have been “Enhanced Spectrum Bulbs” introduced that contain more of the entire spectrum of light. Therefore, on your MH lights, more red light is produced and on your HPS lights, more blue light is produced. These Enhanced Spectrum Bulbs are great because they more closely emulate the sun than any other bulb on the market. The AgroSun Gold should be your go to choice if you were to choose only one bulb. It is a Metal Halide light that produces 49% more red light than any other typical MH light. This makes it very closely resemble the sun which is what you want for a balanced healthy plant. If you want an HPS bulb with the similar qualities the AgroSun Gold has is the Hortilux. This bulb is an enhanced spectrum bulb and also produces a higher lumen/watt ratio. It produces the blue end of the spectrum without reducing the red end of the spectrum. HPS bulbs should be replaced every two to three years and MH bulbs should be replaced every year. You should also be careful as to how quickly you restart a bulb that has recently been on. MH light bulbs should be turned off for about 20 minutes before turning back on to ensure that they have cooled off enough so as not to be burned out. Doing this will affect the intensity of the light and shorten its livelihood. HPS lights are a little bit more flexible and should be turned on after about 2 or 3 minutes after turning them off. In the worst case scenario, bulbs can explode if not handled correctly. You should always handle the bulb through another medium because the oil on your fingers is not good for the bulb. A simple recommendation is to use a paper towel when handling the bulb. Handling the bulb when it is too cold has the potential of breaking it because it is harder than usual and therefore absorbs less impact. Cleaning a bulb is like cleaning any other bulb, but you may want to do it more often than other bulbs. This will keep the bulb nice and bright and limit the amount of dust covering the light. To clean the bulb, take a paper towel and apply rubbing alcohol or glass cleaner to the paper towel. Then simply wipe the bulb down while it isn’t too cold. Always allow the bulb to dry before attaching it to the fixture. Some growers don’t value the scale that lumens provides because it doesn’t account for plant sensitivity but rather, human sensitivity to the light. A different scale that many growers prefer is par value or micromoles which provides a more accurate sense of the amount of valuable light given to the plant. Lumens are the particles directly given off of any light. This differs from foot-candles, the unit of measure that is defined by how much light is actually being provided to the plant. Just because a light has a high amount of lumens doesn’t mean they are necessarily being used effectively. The effectiveness of a light setup is how many foot-candles are being applied to the plant without burning the plant. Reflectors come as either a horizontal or a vertical reflector. They are both similar but they hold the bulbs differently. The horizontal reflector holds the bulb horizontally as the name would suggest. Horizontal reflectors typically reflect light downwards in a box type shape and have two chains that hold it from each end of the top of the reflector. This contrasts the circular shape that a vertical reflector gives off. A vertical reflector also has only one chain in the very middle because that is where all the weight is distributed. Vertical reflectors allow the plants to get closer to the light because of the cone shape these reflectors are attributed with. This also contrasts the horizontal reflector, which typically cannot be placed as close to the plants as a vertical reflector would be able to. Light movers are just what the name implies. An innovative device that rolls back and forth on a rail to distribute the light evenly over a larger area. Therefore, maximizing the space you have to grow while also saving electricity since less grow lights will be needed. These come in two different styles: those that move along a line, and those that move along a circle. There are many different light movers that can cover big areas with up to three lights. The main advantage of a light mover is the ability for the light to move directly over the plant without staying long enough to burn the plant. This gives you the optimal amount of energy to your plants while being able to use a ower lumen bulb. It is the most efficient way to grow to say the least. Also, the plant doesn't have to fight towards the light for exposure and all plants will receive an equal share of light passed over them. Another advantage to this growing method is one’s ability to use both types of bulbs and giving a fuller spectrum of light. This is the closest way to get to the sun’s natural spectrum of plant growing light. HID lighting generates the most heat of any lighting fixture. This can cause the room to get very hot, however, some plants can maintain in a 90 degree environment if the area is being supplemented with CO2. Heat is, for some plants, very important for the plants biochemical processes. Therefore, even though the air can get very hot, plants can still grow healthily and likely don’t need air conditioning. Something they will likely need is air cooling to remove the excessive heat generated by these lights. A way to do this is have an air duct attached to the reflector with the heat being drawn out by a fan. There are two voltages that are typically used in households:120 volt and 240 volt. A 120v is the main voltage that you will get in most outlets in your house, however, appliance outlets for your fridge, air conditioning, and washing machines will typically be wired at 240v. These different voltages use the exact same amount of electricity with an equal wattage light. Therefore, a 1000 watt light uses the same current on each type of voltage. A 240 volt outlet is considered more stable because it uses half the amps that a 120 volt light uses. This allows it to manage up to about four times the wattage, according to the National Electric Code. The 240 volt outlet can carry up to 5760 watts, much more than the 1500 watts a 120 volt outlet supports. A 240 volt, therefore, can hold many more lights and make it easier for the grower to handle. The only drawback is the need for a double pole breaker and the different type of outlet that a 240v can plug into. In a growing room you will need 20 (min) to 60 (max) watts per square footage of growing area. To find your square footage, simply multiply the width (in feet) by the length (also in feet) of the growing area. Say you have a 5’ by 3’ space. That equates to a 15 square feet growing area. We’ll say, for example, that you need 40 watts per square foot (this depends on what type of plants you’re growing). Since your growing area is 15 square feet, multiply 15 by how many watts per square foot you need. So this would equal 40 x 15 or a 600 watt light. In order to calculate the costs associated with running very powerful lights all day, you will first need to find your last electric bill and locate the spot where it tells you your kilowatts per hour (KWH) cost. Then, you will need to add up how many watts your lights are running in total. After that, you will need to divide that number by 1000 (because 1000 W = 1 KW). That number will give you how many kilowatts per hour you are using. Multiply that number by the cost (determined before) and you have your cost per hour.